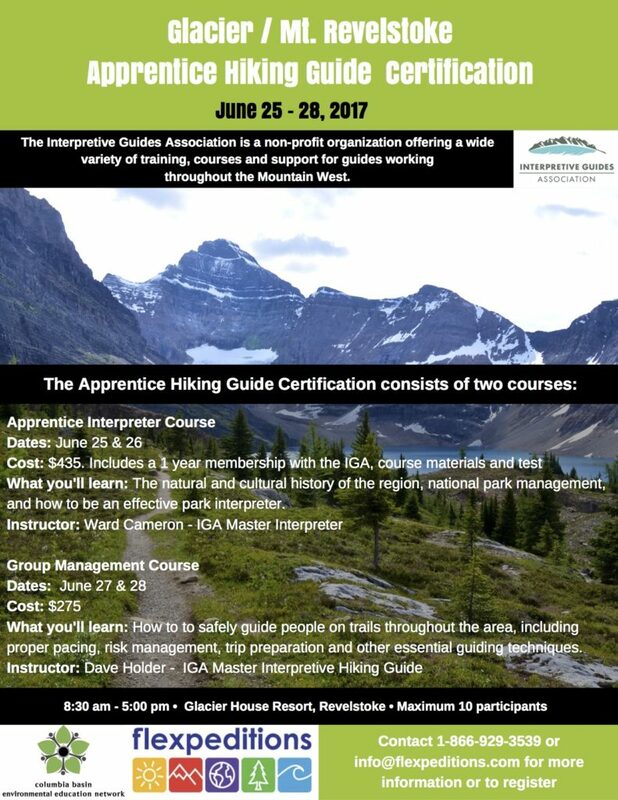 For the first time in Revelstoke, Banff's Interpretive Guides Association is bringing you the Apprentice Interpreter and Group Management courses. These are the first steps towards Apprentice Hiking Guide certification. The Apprentice Hiking Guide Certification is obtained upon successful completion of the 2-day Apprentice Interpreter Course and the 2-day Group Management course. It is highly recommended that these courses be taken consecutively. We organise these courses so the Group Management course immediately follows the Apprentice Interpreter courses. In order to be accredited as an Apprentice Hiking Guide, you must register for both the apprentice interpreter and group management courses separately. Click the links below to reserve your place. All Apprentice Hiking Guides are required to have a minimum 16-hour standard first aid certification and a hiking resume outlining at least 5 full day hikes they have done in the area they are guiding in the past two years. The course fee includes an IGA digital manual (this will be emailed to you once you have paid your fees) and a membership with the association that is good for one full year from the date of purchase. If you cannot access the digital manual after it has been sent to you get in contact with us right away. This manual is essential for this course! For details and bookings of the Apprentice Interpreter Course, click here. For details and bookings of the Group Management Course, click here. Please note: these courses must be taken consecutively and you must book yourself on both courses for the Apprentice Hiking Guide certification.